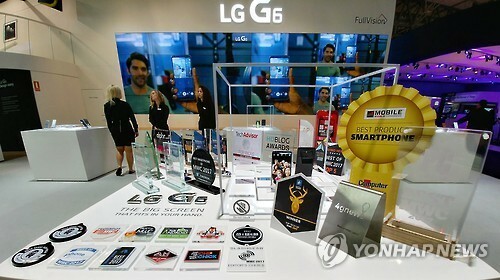 LG Electronics Inc. said Friday its new flagship smartphone, G6, has won a total of 31 awards from foreign technology magazines at a wireless industry fair in Spain. LG unveiled the G6 smartphone earlier this week at the annual Mobile World Congress fair with the aim of reviving its loss-making smartphone business. Samsung Electronics Co. and Apple Inc. did not release their new flagship smartphones at the fair. According to LG, foreign technology media organizations, including Wired, Digital Trends and Android Central, named the G6 as one of the best smartphones at the fair. The foreign media organizations hailed the G6's slightly rounded metal frame, which makes holding onto the smartphone comfortable, and its full-sized screen, LG said. In a previous statement, LG said the G6 is a "back-to-basics approach to premium smartphones, with a focus on the features consumers want, most notably a big screen that actually fits in one hand." "The LG G6 offers users new visual and manual experiences, as it marries an expanded screen with the convenience of one-handed use," said Cho Juno, head of LG's smartphone division, in the statement.